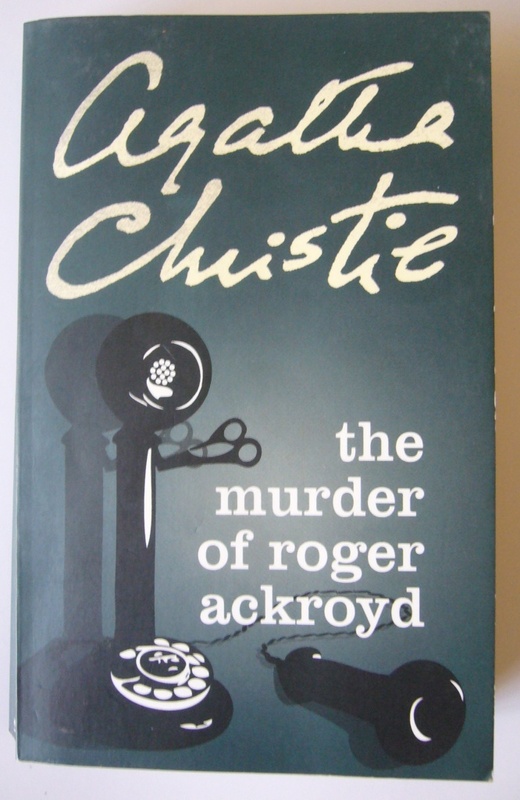 So, I recently read Agatha Christie’s The Murder Of Roger Ackroyd. If you haven’t read it, you should really read it. It is pretty amazing. I was a little put off by the way that the narrator only has a personality that’s filled in with very broad strokes. I’m used to detective novels where the narrator has a ness-ness–an essence–that permeates the whole book. In this one the main character, the doctor in a little village in the English countryside, doesn’t really put a strong stamp on the novel. And Hercule Poirot, the detective, also doesn’t really feel like he leaps off the page (although he is amusing). The most vivid characters (as in the average episode of Law and Order) are the side-characters. The doctor’s gossipy sister is a real prize, I loved her. But also the various people around the manner are interesting, albeit archetypical. The real joy of the book is the plotting, though. This book has some of the meticulous plotting I’ve ever seen. It’s like a machine. Recently, we had a fiction workshop with Alice McDermott where she talked about how the beginning of a novel should be filled with the people and complications that are going to propel the rest of the novel forward. Agatha Christie definitely follows this advice. She doesn’t raise just one conundrum, she raises fifteen. How did this guy get murdered if the door was locked? Who murdered him if everyone has an alibi? Who was blackmailing his girlfriend? Who was his son talking to in the forest? Who does this mysterious wedding ring belong to? What’s up with the anonymous phone call that alerted the doctor to his death? Who was the man who the doctor met as he was leaving the manor? The mysteries just pile higher and higher into this massive tottering edifice. And they don’t get resolved one by one, either. Each time one mystery is answered, it adds two more. And with every suspect who gets eliminated, there’s that much more pressure on each of the others. By the end, you feel like anyone can be the murderer. It was fantastic. I’ve never read anything like it. And I highly recommend it. I think this is a perfect example of why all books don’t necessarily need to have all things. The fact that this book had less of the typical joys of the detective novel (setting and personality) allowed me to enjoy its superlative plotting. In this case, I wouldn’t say that it’s thinness is at all a flaw. In fact, considering all the juggling that Christie is doing, I wonder if it would’ve even worked at all if the novel had been more filled with voice and details. I suspect that it would’ve failed. Can anyone recommend another good Agatha Christie novel for me to read? I’ve been thinking about Murder on the Orient Express. You know that Agatha Christie used to dream up her plots while eating apples in the bath? Thanks for your comment Alastair. Yes, I did get a hint of this weird Agatha Christie small-village world. I think I’ll get a better sense of it as I read more of her books, though, and I’m sure that over time it’ll build up, in my mind, into something that’s as vivid as Raymond Chandler’s LA. I think that authors tend to build these comprehensive worlds / settings that span over many books, and that since I’ve only read one, I haven’t really started to understand the uniqueness of Christie’s world. I just realised that I said devilled kidneys for lunch – in fact, they have them for breakfast (er of course!). I love Chandler’s LA too. Is it a coincidence that both Christie and Chandler lived abroad? Christie spent a lot of time in the Middle East with her archaeologist husband. Chandler of course went to school in England. If you live abroad, you see your home town in a different light, and you spot what’s fun and exotic about it for foreign visitors (and readers). Ooh, Agatha Christie writing about aeroplanes seems pretty interesting. Yes, Chandler’s LA is such a crazy, evocative, lonely place. I still remember those high hillside houses in Bay City that can only (or well, can most easily) be reached by staircase. They were so eerie. I would suggest: “then there were none”/”ten little indians”. My personal favorite is the Tommy and Tuppence mystery Postern of Fate. I really enjoy Tommy and Tuppence, maybe it’s the dialog, or the sense of affection that is conveyed in those novels. I have a soft spot for 4:50 from Paddington, because i read it on the way home from London where every day I was in Paddington station taking the tube or the train. 4:50 has a kind of bleak, waiting for something, sort of novel. kind of like waiting in a big train station like Paddington. I also enjoyed The Labours of Hercules (12 short stories). It was fun to read. Poirot and Tommy and Tuppence are characters she visits throughout their adult lives. I enjoy that continuity. I read “And Then There Were None” when I was 11 or 12, staying up until the middle of the night reading, and then I was afraid to go down the hall to the bathroom to brush my teeth. One of my creepiest reads ever (although I was only eleven, so it might not be so creepy anymore). And Then There Were None does sound like a good one. Apparently it’s the best selling novel in all history, too, with one hundred million copies sold. That is kind of astonishing.